Carbonates are the most important carbon reservoirs on the planet. But what role do they play in the Earth’s interior? How do they react to conditions in the Earth’s mantle? These are the questions being asked by a group of scientific researchers from Frankfurt, Bayreuth, Berlin/Potsdam, Freiberg and Hamburg, in a project funded by the DFG. The Research Unit brings together experts from various geoscience disciplines and cutting edge technology. The Earth has an average radius of around 6,400 kilometers. However, the deepest borehole thus far drilled has only reached a depth of twelve kilometers. And even with huge technical advances, it is unthinkable that we will ever be able to carry out empirical research on the deepest layers, according to Björn Winkler, Professor of Crystallography at the Goethe University Frankfurt and coordinator of the new Research Unit. “We can only get an idea of the conditions in the Earth’s interior by combining experiments and model calculations”, he explains. While we already have detailed knowledge of silicates, which are a key component of the earth’s mantle, very little research on carbonates has been done to date. “The composition of the earth can be explained without carbonates – but the question is, how well?”, continues Winkler. “Structures, Properties and Reactions of Carbonates at High Temperatures and Pressures” is the title of the project being funded by the DFG as of mid-February. “We want to understand how the Earth works,” is the way Winkler describes the primary research goal of the approximately 30 scientists and their teams. What possibilities our planet has for storing carbon, how much carbon there actually is on the earth – the entire carbon cycle is still a complete mystery. 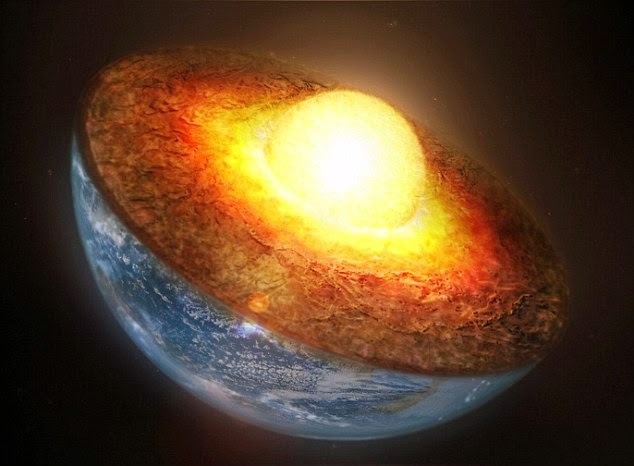 The research group, which combines seven individual projects, is focusing its attention on the Earth’s mantle: the 2,850 kilometer thick middle layer in the internal structure of the earth. The aim is to come to a better understanding of the phase relationships, crystal chemistry and physical properties of carbonates. To that end, the plan is to simulate the conditions of the mantle transition zone and the lower earth mantle below it – namely very high temperatures and very high pressure. Each of the seven projects examines a different aspect; for example the carbonate calcite, or the combination of carbonates with iron or silicates, or the behavior of carbonates under shock. Winkler and his team have been dealing with this issue for six years already. His colleague, Dr. Lkhamsuren Bayarjargal has already been awarded the Max-von-Laue Prize from the German Association of Crystallography for his work with high-power lasers, and has received funding from the Focus Program of the Goethe University. The nationwide collaboration among the researchers is not an entirely new phenomenon either. The DFG funding will enable them to build special equipment to simulate the conditions in the Earth’s mantle. This research apparatus includes diamond anvil cells, capable of producing pressures a million times greater than atmospheric pressure, and high-power lasers that can generate temperatures of up to 5,000 degrees Celsius. Calculations have shown that these are the conditions that prevail in the Earth’s mantle. The tiniest amounts of a carbonate are enough for an experiment. During the experiment, the substance is exposed to the respective conditions while the researchers examine it for any changes. A variety of techniques are used for this, such as Raman spectroscopy in Frankfurt, and infrared spectroscopy in Potsdam. “If we come to the same conclusions using different methods, we will know that we have got it right,” says Prof. Winkler. Note : The above story is based on materials provided by Goethe University.